GTBZ25 Telescopic Boom Lift applies to shipbuilding, large steel structure building, construction, civil engineering and advertising industries, etc. 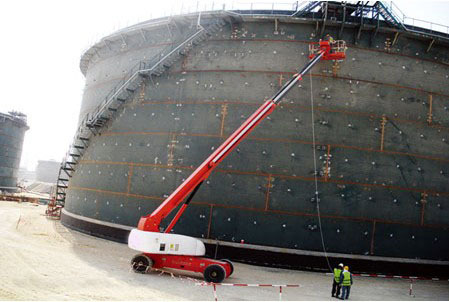 This aerial work platform is safe and reliable. Designed with the concept of durability, solidity, and excellent performance, it can meet the need of extremely challenging operating conditions. The maximal grade ability of 45% allows parking and restarting on such slope without down sliding. Imported from USA, the engine is in a position to supply large power; the solid tires enjoy a long life. PLC is imported originally for military purpose. Program can be set and developed as required by customers. 1. Wide operating range: 360° full direction operation at the height from 0~89 ft 2 in (27.2 m), with a horizontal outreach by 71 ft 9 in (21.9 m). 2. Large load capacity: The maximum load capacity is 1058 lbs (480 kg); the platform can hold 2 operators. 3. Powerful driving force: The engine is of famous international brand, large in power and excellent in grade ability. The maximal grade ability can be up to 45%.